Tourists at the Ugandan Museum. Despite the fact that the museum is about 4kms from Kampala city centre, few Ugandans visit it. 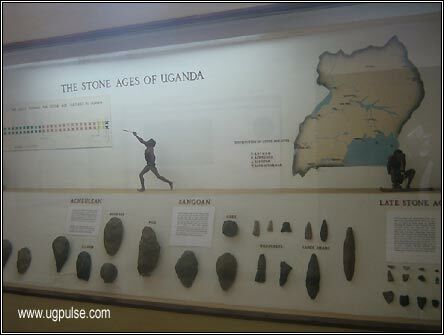 If seeing is believing, then you need to visit the Uganda Museum. To clearly understand Uganda's multicultural past, you will have to visit the museum located on Kiira Road (near Mulago hospital), about 4kms from Kampala city centre. Despite the fact that the museum houses gems of Uganda's heritage, few Ugandans visit it. 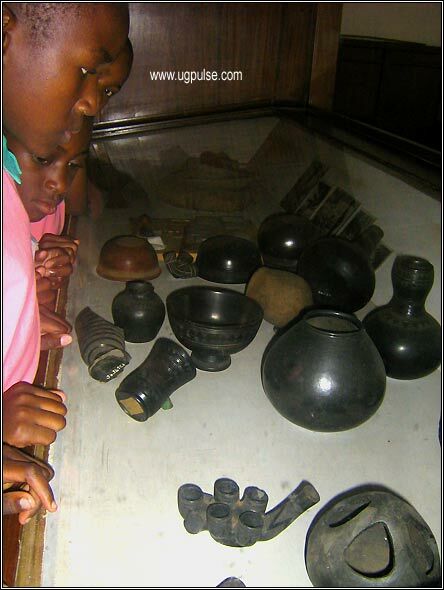 The museum displays Uganda's indigenous culture, archeology, history, science, and natural history. At the entrance, you are welcomed by photos, calendars, posters with images of different Ugandan geographical features, animals, birds and insects displayed behind the reception desk. Entry for each Ugandan adult costs 1000 Uganda shillings, while Ugandan children pay 500 shillings each. Non-Ugandan adults part with 3000 shillings to access the museum while non-Uganda children pay 1,500 shillings. If you are carrying a still camera, you pay an additional 5,000 shillings; carrying a video camera will see you pay an extra 20,000 Uganda shillings. The only exception is if you are lucky to be a journalist (with verifiable identification) like this writer, who was allowed in free of charge. Past the reception, you enter a foyer/lobby where you find directions to the different sections of the museum. If you walk straight through the lobby, you will enter the Independence Pavilion of Science and Technology. If you decide to turn left, you will access the musical instruments section as well as the Stone Age Gallery. To the right is the History and Iron Age Display. A strong reed doorway leads to the Traditional Life Gallery, the Natural History Centre and the Paleontology Centre. Time to choose your first stop. 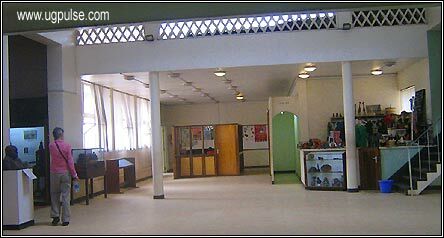 The central lobby at Uganda Museum. While you are still in the lobby, on display are photographs of historical human interest from Uganda and other African countries. They include fossilized pre-human footprints found at Lactoli in Tanzania (aged 3.7 million years and found in 1976 buried in hardened volcanic ash), the evolution and history of the Rift Valley, the Lake Baringo basin in Kenya and others - all with notes explaining their historical significance. In the Stone Age section, you will be able to observe physical tools used by Stone Age people. 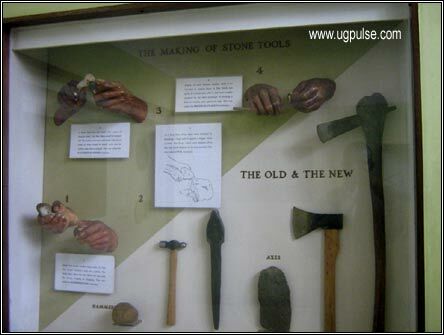 These tools include stones, bones and wood used for cutting, scrapping and chipping and how they evolved into the modern tools that Ugandans use today or used in the recent past. You will also be able to see how we evolved from our ancestors, from the pre-history period, through the history of apes and how they evolved into humans. The story is told by the displayed pictures as well as real tools and bones or skulls that make the history we learn in school more real. Uganda's multicultural and colourful past becomes alive as you tour the History and Iron Age displays depicting the traditional ways of life in different kingdoms, tribes and communities of Uganda. Here you find striking displays of traditional clothing (mostly barkcloth and animal skin), headdress, hair dressing, as well as hunting, the history of transportation, fishing, agriculture, war, religion, and how our ancestors spent their free time (traditional recreation). The displays explain that all Ugandan communities enjoyed music and dancing, as well as drinking beer and playing various games. Gathered all over Uganda from the Madi in northern Uganda, to the Bahima in the south, these depictions have made the museum a favourite stop for school children, since the history they learn theoretically gets practical explanations or depictions at the museum. At the time this writer visited the museum, pupils of St. Theresa Namilyango Girls School were having a guided tour led by staff at the museum. Whether you choose a guided tour or decide to navigate the museum by yourself, you will be able to learn about and understand many things in finer detail. 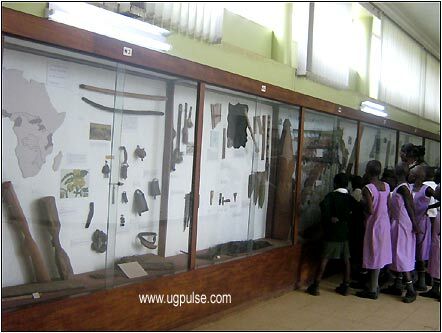 Pupils of St.Theresa Namilyango Primary School visiting the Uganda Museum. For example, the making of salt, an expensive commodity in the past, is exemplified by the raw material (ash) from Kibiro springs in Bunyoro, Lake Katwe in Tooro and the different pots and calabashes that were/are used to produce salt as a final product. You are also able to see the baskets, hooks, lines, spears and nets that were used for fishing in the distant past. This indicates an industrious people who also engaged in industrial work like iron smelting, foundry, weaving, making clothes and ceremonial robes. Examples of all these items are on display. Here, you also learn about the different materials our ancestors used for the prevention, diagnosis, and treatment of illnesses. You will be surprised to learn that surgery did not begin with modern medicine from the west, as you will find on display photos and actual surgical tools from the olden days. Also of interest is the display that describes how justice was dispensed in Uganda many years ago. With no penal code, police force or criminal investigations department as they exist today, how did people in earlier days know/proove who had committed which crime and what punishment fitted him/her? You will be able to learn that the Madi and Lugbara used divine pots to assess the innocence of the accused, while some other tribes used divination leathers to identify who had committed a crime, as well as find fitting sentences. Since going to war was part of almost all nations in the past, all tribes in Uganda traditionally made war tools (arms) and these are on display at the museum. These tools were not always used in war but for self-defence too. Hunting tools on display from different Ugandan tribes also show that most tribes depended a lot on hunting. You will also be able to learn about the major economic activities of the different tribes of Uganda, the history of their livestock and the origin of different cattle types and crops from photo displays. The migration routes of the different people of Uganda and descriptions of the Nilo-Hamites, Luo, Highland Nilotics, Sudanic, Bantu and Bushmanoid are also shown here. Stone power: The tools of Uganda's fore-fathers. In the Natural History Centre, one is able to see and learn about Uganda's lakes, rivers, fish, insects, reptiles, and bird species (physical imitations are made out of clay and other materials). Birds like the woodpecker, hornbill, secretary bird, pennant wing, nightjar, sunbird, skimmer, darter, lily-trotter, and the black winged stilt among others are shown here. Some are presented in the form of fossilised bones, plants or skeletons. It is in the paleontology section that you will learn about environmental and climatic changes, archeological excavations, as well as find paintings of early settlements and traditional architecture. The latest addition here is a selection of fossil material from the Albertine region that will help you understand the history of Uganda's geology, animals, and environment. The Science and Technology section is the most disappointing with only a few woodworks on display, the biggest being a boat. Those who enjoy traditional African music will find a good entertainment centre in the Uganda Museum. Apart from having indigenous music instruments (drums, lyres, xylophone, harps and tube-fiddles) from the different tribes of Uganda on display, the museum employs a group of players who play the instruments and dance for visitors. Visiting the Uganda Museum is a worthwhile journey of cultural and traditional exploration that will surely benefit all those who undertake it. The Government of Uganda should encourage all Ugandans to take this journey. The Uganda Museum falls under the Depart of Antiquities and Museums in the Ministry of Tourism, Wildlife and Antiquities. It was established to conserve, promote and interpret Uganda's cultural and natural heritage through research collections, documentation and imparting knowledge for toady and the future. According to a brochure supplied by the Museum, in addition to the materials in the galleries for public viewing, the museum keeps reserve collections of ethnographical, archeological, natural history, paleontological interest as well fine art for scholars to study. The Museum has an education service unit, with qualified staff who attend to visitors. The museum depends very much on the public, not just for patronage, but also for helping build up collections and in recording new discoveries. Offers of suitable specimens are always welcome. Tourists visiting the Uganda Museum. The Uganda Museum was founded in 1908. It was first built at Fort Lugard in Old Kampala, where it stayed until 1942 when it was transferred to Makerere University and Margret Trowel took over as curator. It was from Makerere that it moved to Kiira Road in 1954. For almost a century, the Uganda Museum has been providing pre-history, indigenous life, traditional music, science and industry, fossil, landscape, animal and bird exhibitions, while serving as an education centre and a research centre. The Uganda Museum also hosts the Uganda Society's library. Started in the 1930's by a group of scholars, the collection is comprised of approximately 3,000 volumes, maps, periodicals and photographs, all pertaining to African history, culture, sociology, travel and science. In addition to its collection, the library houses the books of the East African Wildlife Society and a number of books from the museum, which were given to the society's care many years ago. Although the library was a circulating library for many years, due to the limited availability of the books and their value, the collection is currently available for reference use only. The library collection includes a 'rare books' section which contains several signed first editions, including volumes from the personal collections of Dr. Albert Cook. It also features a complete collection of The Uganda Journal, which has been published by the society since 1934. (The collection was completed after a generous donation from Guy Yeoman's his widow in 1999.) According to the Uganda Society, almost one third of the books in the collection are rare books, either in the traditional sense or simply not otherwise available in public collections in Uganda. Books such as Rev. John Roscoe's treatises on the tribes of Uganda are available on the world market, but there are few of them in public collections in Uganda. When and where they are found, they are often damaged or have sections missing. 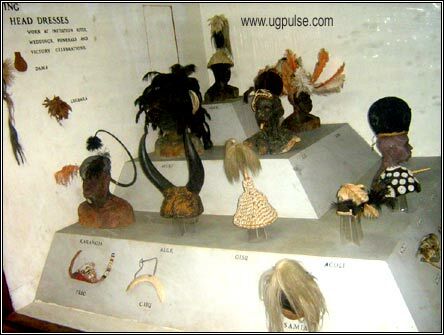 A variety of indigenous head gear from Uganda is displayed at the museum. The Uganda Museum gardens and halls are available for hosting parties, workshops and bazaars. Additionally, the museum hosts a number of crafts shops. It is expected that the museum will soon host a modern cultural village ahead of the Commonwealth Heads of Government Meeting (CHOGM) scheduled for November 2007 in Kampala. Dr Ephraim Kamuhangire, the Commissioner for Museums and Monuments says the village will present modern architectural heritage of the cultural societies in Uganda and is expected to become a tourist attraction, as permanent artists will occupy the area to boost the tourism economy of Uganda after the CHOGM. The Uganda Museum is open from 10am to 6pm Monday to Saturday. On Sundays, it opens from 3pm to 7pm.